The Walk is a 2015 American 3D biographical drama film directed by Robert Zemeckis and written by Christopher Browne and Zemeckis. It is based on the story of 24-year-old French high-wire artist Philippe Petit's walk between the Twin Towers of the World Trade Center on August 7, 1974. The film stars Joseph Gordon-Levitt, Ben Kingsley, Charlotte Le Bon, James Badge Dale, Ben Schwartz and Steve Valentine. The film was released by TriStar Pictures on September 30, 2015, in the United States in IMAX 3D, and on October 9 in regular 2D and 3D. It was dedicated to the victims of the September 11 attacks. In 1973, French street performer Philippe Petit is trying to make a living in Paris with juggling acts and wire walking, much to the chagrin of his father. During one performance, he eats a hard candy which was given to him by an audience member and injures his tooth. He visits the dentist and, while in the waiting room, sees a picture in a magazine of the Twin Towers in New York City. He analyzes the photo and decides to make it his mission to walk a tightrope between the two buildings. Meanwhile, he is evicted from his parents' house by his father, citing his lack of income and the fact that he is a street performer. Philippe returns to the circus that inspired him to wire walk as a child and practices in the big top after hours, but is caught by Papa Rudy, whom he impresses with his juggling skills. While performing one day, Philippe meets a woman and fellow street performer named Annie, and they begin a romantic relationship. He also explains that although he did not know it at the time, she was his first "accomplice." He tells Annie about his dream to walk between the towers of the World Trade Center and she supports him and gives him a perfect place to practice at her music school. Philippe meets a photographer named Jean-Louis and befriends him, who becomes Philippe's official photographer and second accomplice in his "coup." Philippe asks Papa Rudy for tips and advice on knot tying and rope rigging, which Papa Rudy agrees to for compensation. After failing his first real performance by falling into a lake, Philippe decides to attempt to walk on the Notre Dame Cathedral in Paris to redeem himself. He succeeds with the support of Jean-Louis but is arrested in the process. Jean-Louis introduces Jeff, another accomplice who has a fear of heights, to Philippe and Annie, while explaining his idea to use a bow and arrow tied to a fishing line to get the cable across the Towers. Philippe and Annie then travel to America, setting the date for the walk as August 6, 1974. Philippe dresses in disguises to spy on the construction crews and scout out the locations, impaling his foot on a nail in the process. At one point, he meets a man who reveals he is a fan of Philippe's and saw him at Notre Dame. He introduces himself as Barry Greenhouse, a life insurance salesman who works in the building, becoming another member of Philippe's team. They also meet French-speaking electronics salesman J.P., amateur photographer Albert, and stoner David. The gang goes over the plan several times, ending with the notion that Philippe must be on the wire before the construction crews arrive at 7:00 a.m.
On the eve of the event, the gang encounters several challenges, such as being three hours behind schedule, guards on the premises and nearly dropping the heavy cable off the roof. However, they successfully string up the ropes and set the cables. Philippe begins his walk, explaining that everything around him faded once he started, except the wire and himself, and that for the first time in his life he felt truly thankful and at peace. He successfully crosses the gap between the towers while crowds below cheer him on. Once he reaches he has an urge to return, so he walks back again across the void. At one point he kneels to his audience and even lies down. The police arrive, and threaten to remove him by helicopter if he does not get off, but Philippe relentlessly continues to walk back and forth until he achieves the feat a total of six times in his 45-minute performance and felt confident enough to showboat on occasion before being ordered down by the local police. He is arrested on site, with the police and construction workers commending him on his bravery. Philippe and his accomplices are eventually released and he decides to remain in New York, but Annie chooses to follow her dream, and return to Paris. The building manager gives Philippe a free pass to the observation decks of both towers, and Philippe gives a final look to the camera, with the Twin Towers in the background, as he says the expiration date on the pass was crossed out and changed to "forever." On January 23, 2014, it was announced that Robert Zemeckis would direct a film based on the story of Philippe Petit's walk between the Twin Towers of the World Trade Center in 1974. It was also confirmed that Zemeckis wanted Joseph Gordon-Levitt to star in the film as Petit. Zemeckis first came across the story of Petit from the children's book The Man Who Walked Between the Towers. At first, Zemeckis questioned whether or not the story was true as he did not recall the event, saying he "somehow missed it." Zemeckis immediately recognized the potential for a movie, telling Deadline: "To me, it had everything that you want in a movie. It had an interesting character who’s driven, and obsessed, and passionate. It had all this caper stuff. He was an outlaw. There was suspense. And then he did this death-defying thing." By February 2014, Gordon-Levitt was confirmed to star in the film. In April 2014, Charlotte Le Bon, Ben Kingsley and James Badge Dale joined the cast of the film. On May 6, 2014, it was announced that the film would be released on October 2, 2015. In May 2014, Steve Valentine and Ben Schwartz joined the cast of the film. Principal photography began on May 26, 2014, in Montreal, and ended on August 6, 2014. 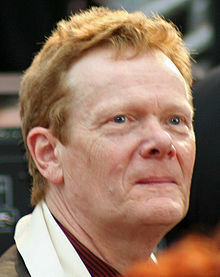 Philippe Petit personally trained Gordon-Levitt how to walk on wire. He optimistically predicted that the actor would be able to walk on the wire alone after an elaborate workshop of eight days, which the actor did. Gordon-Levitt, who had no formal high-wire experience, trained directly with Petit. By the end of the eighth day, he was able to walk on the wire by himself, and continued to practice while shooting. Along with a stunt double, the actor shot the climactic wire-walking scenes on a soundstage; it had reconstructions of the top two stories of the tower and a wire approximately twelve feet off the ground, which was connected out across a green abyss and was anchored on a pole. To learn more about what it was like, Gordon-Levitt also walked the distance between the World Trade Center memorial's two pools, which are located where the Twin Towers stood before the September 11 attacks. He visited the original observatory once before, in 2001, during his first summer in New York City. "It was touristy but I wanted to go do it. I remember it distinctly. It felt more like being in the sky than being on a tall building." Aside from wire-walking, Gordon-Levitt also learned to speak French fluently, perfecting a Parisian accent aided by Le Bon and other French actors on set. The film premiered at the New York Film Festival on September 26, 2015. It had an early release in IMAX on September 30, 2015, before a wide theatrical release on October 9, 2015. 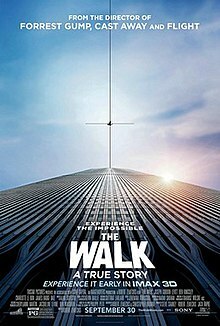 The Walk grossed $10.1 million in North America and $51 million in other territories for a worldwide total of $61.2 million, against a budget of $35 million. The film was released into IMAX theaters on Wednesday, September 30, 2015. In the opening weekend of its limited release, the film grossed $1.6 million, finishing 11th at the box office. During the first weekend of its wide release a week later, the film grossed $3.7 million, coming in seventh. The Walk received positive reviews from critics, with praise for Gordon-Levitt's performance, Zemeckis' direction and the visual effects, particularly during the wire walk scene. On Rotten Tomatoes the film has a rating of 84%, based on 226 reviews, with an average rating of 7.2/10. The site's critical consensus reads, "The Walk attempts a tricky balancing act between thrilling visuals and fact-based drama – and like its wire-walking protagonist, pulls it off with impressive élan." On Metacritic, the film has a score of 70 out of 100, based on 41 critics, indicating "generally favorable reviews". On CinemaScore, audiences gave the film an average grade of "A-" on an A+ to F scale. The Walk is an amazing film, and is so on multiple levels. Joseph Gordon-Levitt puts forth such an easy charm crossed with a fierce determination that it is impossible not to fall in love with Philippe Petit as he attempts what sounds utterly suicidal. The planning and set up of the caper are as fun as any heist movie. And, even though everyone watching knows exactly what the film is building towards, the climactic sequence delivers everything you want and more. Peter Debruge of Variety gave the film a positive review, saying "A filmmaker with a gift for overcoming the seemingly impossible puts audiences in the place of the man who walked between the Twin Towers in this gripping human-interest story." David Rooney of The Hollywood Reporter gave the film a positive review, saying "The film's payoff more than compensates for a lumbering setup, laden with cloying voiceover narration and strained whimsy." Michael Phillips of the Chicago Tribune gave the film two and a half stars out of four, saying "The film gets better as it goes, and the last half-hour (especially in 3-D on an Imax screen) is nearly everything it should be: scary, visually momentous, meticulously realized." Lou Lumenick of the New York Post gave the film three out of four stars, saying "Zemeckis finally delivers the goods in abundance in the section that really counts: A vertigo-inducing digital re-creation of Petit's famous walk back and forth between the towers." Ann Hornaday of The Washington Post gave the film two and a half stars out of four, saying "The Walk satisfies as an absorbing yarn of authority-flouting adventure and as an example of stomach-flipping you-are-there-ness. The journey it offers viewers doesn't just span 140 feet, but also an ethereal, now-vanished, world." Peter Travers of Rolling Stone gave the film three out of four stars, saying "Expect the worst from the first half- that's before Philippe Petit (Joseph Gordon-Levitt) strings up a wire between the World Trade Center towers. But then, oh, baby, does this movie fly." Richard Roeper of the Chicago Sun-Times gave the film three out of four stars, saying "The last 30 minutes or so are all about the walk. Dariusz Wolski's cinematography is beautiful... and Gordon-Levitt does some of his best acting when he's out on the wire and mostly silent, his face glowing from the sheer crazy joy he's feeling." James Berardinelli of ReelViews gave the film three out of four stars, saying "It's two-thirds of a great film but the slow start and unremarkable first hour hold it back. Still, for those who buy into the precept that good things are worth waiting for, The Walk unquestionably delivers." Brian Truitt of USA Today gave the film two and a half stars out of four, saying "For those who want to feel like they're 110 stories up and living in the clouds, Hollywood does its job conjuring movie magic with a breathtaking Walk to remember." ^ "THE WALK (PG)". British Board of Film Classification. August 13, 2015. Retrieved August 13, 2015. ^ a b c "The Walk (2015)". Box Office Mojo. Retrieved May 21, 2016. ^ Fleming, Mike. "Robert Zemeckis To Direct Movie About Philippe Petit's World Trade Center Tightrope Walk". Deadline Hollywood. Retrieved June 10, 2014. ^ a b c Fleming, Mike Jr. "'The Walk's Robert Zemeckis On A High Wire Directing Career: Deadline Q&A". Deadline Hollywood. Retrieved November 25, 2015. ^ Fleming, Mike. "Joseph Gordon-Levitt To Play 'Man On Wire' Aerial Artist Philippe Petit". Deadline Hollywood. Retrieved June 10, 2014. ^ "Ben Kingsley, James Badge Dale Join Joseph Gordon-Levitt in 'To Reach the Clouds'". The Hollywood Reporter. Retrieved June 10, 2014. ^ "TriStar Dates Meryl Streep's 'Ricki and the Flash' and Robert Zemeckis' Next Movie". Variety. May 6, 2014. Retrieved June 10, 2014. ^ "Steve Valentine to Join Joseph Gordon-Levitt in Robert Zemeckis' 'The Walk' (Exclusive)". TheWrap. Retrieved June 10, 2014. ^ "Ben Schwartz to Join Joseph Gordon-Levitt in Robert Zemeckis Movie (Exclusive)". TheWrap. May 20, 2014. Retrieved June 10, 2014. ^ "L'acteur Joseph Gordon-Levitt aperçu sur le plateau du film " The Walk " tourné à Montréal (PHOTOS)". Quebec.huffingtonpost.ca. Huffington Post. May 26, 2014. Retrieved June 10, 2014. ^ "Robert Zemeckis' Next Officially Titled The Walk, Wraps Production". ComingSoon.net. Retrieved August 6, 2014. ^ a b c d Ashley Lee (September 26, 2015). "NYFF: How 'The Walk' Director Robert Zemeckis Shot Joseph Gordon-Levitt's "Painful" High-Wire Scenes". The Hollywood Reporter. (Prometheus Global Media). Retrieved September 26, 2015. ^ "Pope's visit forces change of date for The Walk premiere". Entertainment Weekly. Retrieved July 29, 2014. ^ Dave McNarry (June 25, 2015). "Joseph Gordon-Levitt's 'The Walk' Running Early at Imax Locations". Variety. (Penske Media Corporation). Retrieved June 26, 2015. ^ a b Anthony D'Alessandro (October 12, 2015). "'Martian' To Rank No. 1 In Second Weekend: Box Office". Deadline Hollywood. Retrieved November 24, 2015. ^ "The Walk". Rotten Tomatoes. Retrieved February 28, 2016. ^ "The Walk reviews". Metacritic. Retrieved October 6, 2015. ^ John Lasser (October 1, 2015). "The Walk Review". IGN. Retrieved October 5, 2015. ^ Peter Debruge (September 26, 2015). "'The Walk' Review: Robert Zemeckis Pulls Off Death-Defying Stunt". Variety. Retrieved November 24, 2015. ^ "Joseph Gordon-Levitt in 'The Walk': NYFF Review". The Hollywood Reporter. September 26, 2015. Retrieved November 24, 2015. ^ "'The Walk' review: Joseph Gordon-Levitt's high-wire act". Chicago Tribune. Retrieved November 24, 2015. ^ Lumenick, Lou (September 27, 2015). "WTC tightrope docudrama 'The Walk' nails the landing". Nypost.com. Retrieved November 24, 2015. ^ Hornaday, Ann (December 14, 2012). "'The Walk' review: A high-wire act with stomach-flipping you-are-there-ness". The Washington Post. Retrieved November 24, 2015. ^ Travers, Peter (October 1, 2015). "'The Walk' Movie Review". Rolling Stone. Retrieved November 24, 2015. ^ "'The Walk': Star is charming, high-wire visuals stunning". Entertainment.suntimes.com. September 29, 2015. Retrieved November 24, 2015. ^ A movie review by James Berardinelli (October 4, 2015). "Walk, The | Reelviews Movie Reviews". Reelviews.net. Retrieved November 24, 2015. ^ "Review: 'The Walk' runs on visual style". Usatoday.com. September 29, 2015. Retrieved November 24, 2015. ^ Hipes, Patrick (December 14, 2015). "Critics' Choice Awards Nominations: 'Mad Max' Leads Film; ABC, HBO, FX Networks & 'Fargo' Top TV". Deadline. ^ "'Carol' leads 2015 Florida Film Critics Awards Nominations". floridafilmcritics.com. Florida Film Critics Circle. December 21, 2015. ^ "2015 San Diego Film Critics Society's Award Nominations". www.sdfcs.org. San Diego Film Critics Society. December 12, 2015. ^ Clayton Davis (December 14, 2015). "St. Louis Film Critics Nominations - Kristen Stewart and Abraham Attah Make the Cut". AwardsCircuit.com. St. Louis Gateway Film Critics Association. ^ Lenker, Margaret (January 12, 2016). "'Star Wars,' 'Game of Thrones,' 'The Peanuts Movie' Lead Visual Effects Society Nominations". Variety.